Just when you thought the swamp-reality genre had run out of colorful hillbilly-types to follow around on their daily gator-rasslin’ excursions, along comes A&E’s Duck Dynasty. At first glance, it would appear that the network is scraping the bottom of the barrel when it comes to swamp-related activities to cover on a weekly basis. The design, manufacture, and distribution of handmade duck calls may not sound like the makings of compelling television, but while it shares some of the flaws associated with this particular brand of reality TV, Duck Dynasty does have a charismatic, likable cast of characters at its center. The series centers on the Robertson clan of West Monroe, Louisiana. 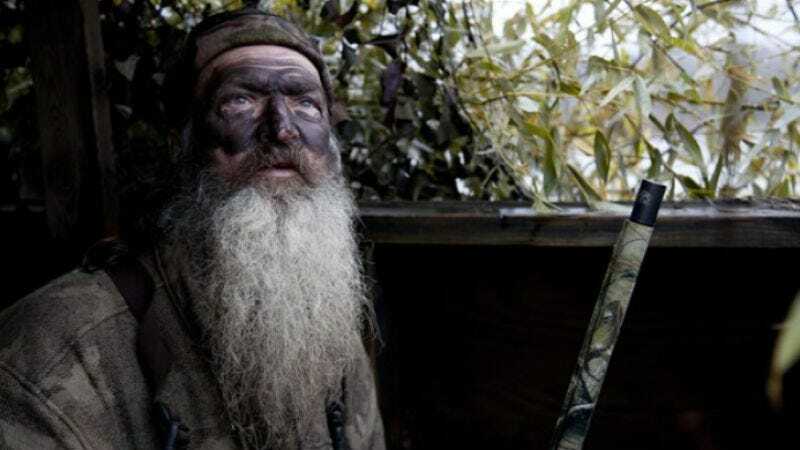 Patriarch Phil Robertson invented the “revolutionary” Duck Commander Duck Call in 1973, and his son Willie has turned the little wooden noisemaker into a multi-million dollar family business. Duck Dynasty presents the Robertsons as modern-day Clampetts who never bothered to move to Beverly Hills. They seemingly have more money than they know what to do with, but they still enjoy the simple pleasures of country living, like fishing, hunting, and dining on squirrel brains. Phil has a laid-back, Zen-by-way-of-Willie-Nelson vibe about him, even when the words that come out of his mouth seem scripted by Ted Nugent. “My idea of happiness is killing things,” he deadpans, and it’s not just a one-liner for him—it’s a way of life. In the first half-hour alone, we see him shooting at ducks, catching frogs for dinner, and clearing a beaver dam of its rightful occupants. Phil really seems to prefer the company of dead animals to living ones, and he doesn’t appear too worried about any ecological side effects. He’s also a bit bemused by his offspring, notably son and Duck Commander CEO Willie, whom he describes as a “suit man,” and his mallrat grandchildren, who are probably better at Mass Effect 3 than frog-skinning. If Willie is a suit man, it’s only by comparison to the rest of his backwoods clan. He has the same ZZ Top beard as the rest of the menfolk, and with his shaggy hair, stocky frame, and ever-present bandanna, he could pass for a Charlie Daniels impersonator. But he’s the only member of the family with a business degree, and his role here is that of the exasperated boss trying to keep the lunatics from taking over the asylum. Other notable members of the Robertson clan include Uncle Si, who speaks exclusively in Vietnam War metaphors; Miss Kay, the matriarch and head cook of the clan; and Jase, Willie’s no-account brother. The first of two episodes airing tonight, “Family Funny Business,” does an efficient and entertaining job of introducing us to this bunch, even as it raises the usual questions about the methods used to produce reality television. I think most of us are well-aware that reality TV is not raw, unadorned cinéma vérité, and we’re fine with that, so long as the producers don’t insult our intelligence by faking it so badly we can’t suspend our disbelief. The Robertsons have been making DVDs for a while, and they’re obviously comfortable in front of the camera, which is fine. But a few of the set-ups in the premiere seemed a bit too set up, notably a sequence in which Jase decides to flood the Duck Commander loading dock in order to create a pond that can be used as a testing ground for new duck calls. Now, did Jase just happen to have this wacky idea when the camera crew showed up to film the first episode of his family’s new TV show? Maybe. Or maybe this is more like a recreation of something that happened long ago and has since become a beloved Robertson family anecdote. If so, I don’t really have a problem with that, except that I find the more naturalistic interactions of the family members far more amusing than wacky hijinx that smell fishy from the get-go. The second episode airing tonight, “CEO For A Day,” feels even more contrived, with its all-too-tidy storylines involving feckless Jase running the company for one day while Phil tries to teach his text-messaging grandchildren the meaning of a hard day’s work. But it’s in the downtime, when the Robertson clan is gathered around the dinner table or the warehouse exchanging jokes and good-natured insults, that this redneck reality show really comes alive. Naturally, the Duck Dynasty theme song is “Sharp-Dressed Man” by ZZ Top.